Not much leverage, just save or bet it. $100k invested in Jan 2010 in housing will not grow as much, unless you add more to it. 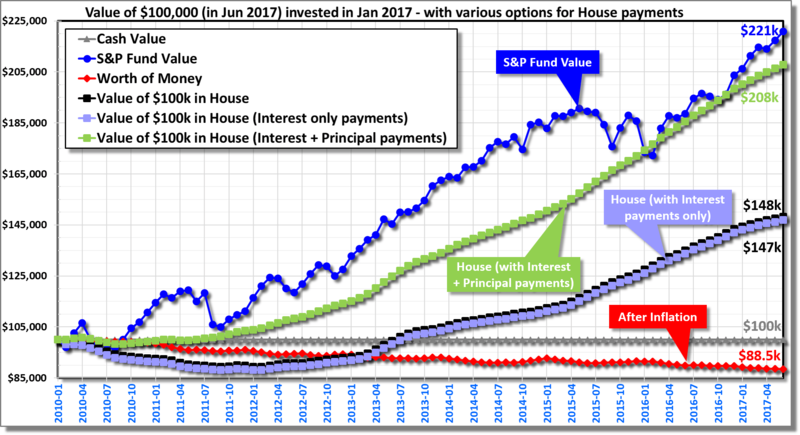 Same plot as shown before (Aug 14, 2017) but updated for different approaches for investing in housing. When invested in S&P Index fund, this time period resulted in the best returns. If you paid the full mortgage on a $500k house with 20% down payment on a 30-year mortgage@4%, your monthly contribution will give a nice bump to the equity. However, if every month you only pay the interest, the growth is about 50%, same as if you bought a house worth $100k in cash. Inflation on the cash in bank will reduce the worth by about 12%. Therefore, the so called ‘leverage’ effect is not significant & most of the gains are due to monthly payment towards the mortgage. Sources: Same as before (Aug 14, 2017) (monthly S&P and CPI data taken from Prof. Shiller’s page; housing data taken for Washington county (zip 97124) from Zillow). The interest rates were calculated using www.calculator.net. No fees or other charges are included. Also, no property tax or tax benefits included for simplicity.